Some see it as a contradiction to me to promote this column as “cheap” and “money-saving,” then recommend Festool, but, as many others can attest along with me, Festool purchases are an investment in value, not just an ordinary tool with an extraordinary price. Some of my earliest Festools came protected in anti-corrosion paper. Any time I get some of this kind of paper, I hoard it. Think of it as adding to the value. 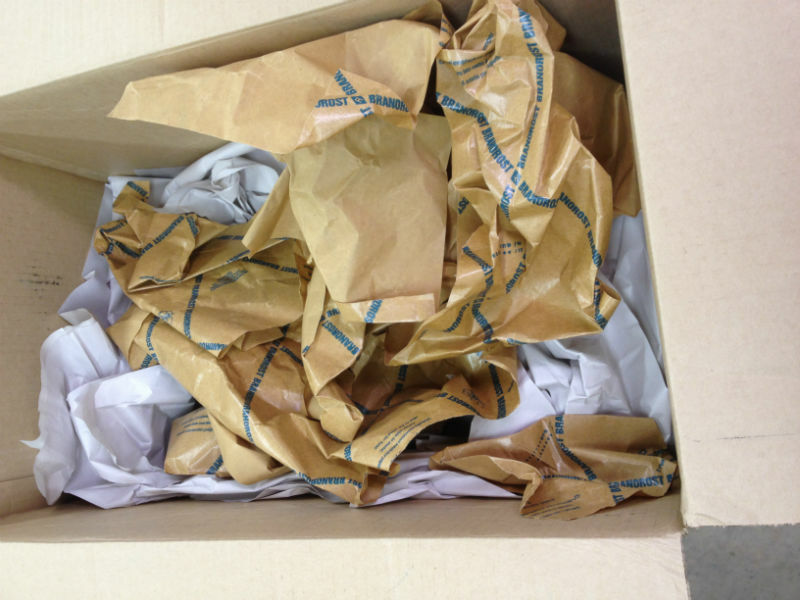 A box full of genuine Festool anti-corrosion paper collected after a tool shipment. Step One is to seal it in one or more Ziploc bags to help retain the active ingredients. A free zipper-locking bag provides long-lasting protection for one’s valuable protective paper. 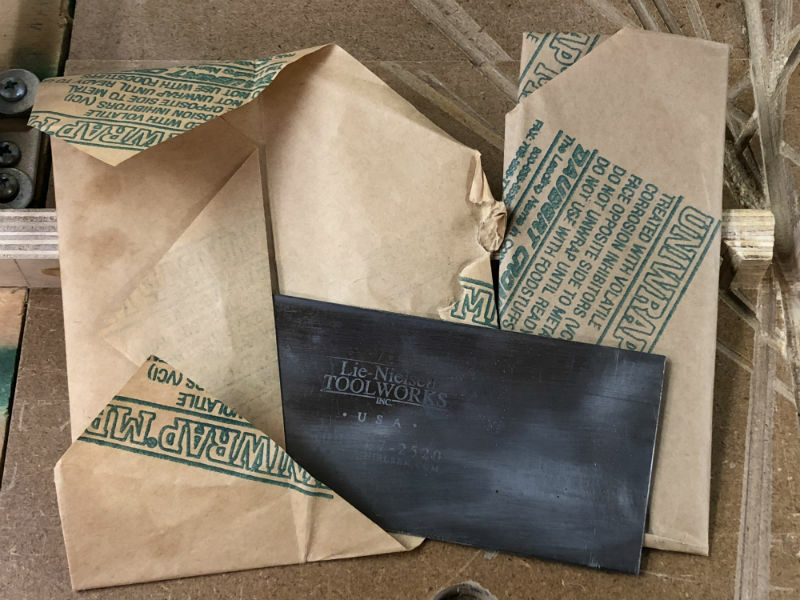 The tools it originally protected may not need it after they leave the vicinity of the Atlantic Ocean, but both ferrous and iron-free tools around your shop can certainly benefit. Have an old iron plane that mostly sits on a shelf? 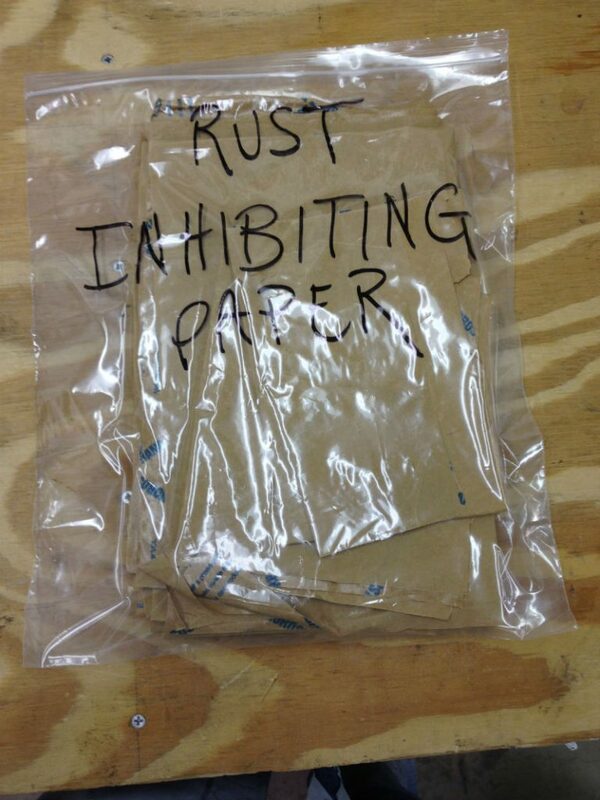 Wrap it up in corrosion-inhibiting paper. These papers are technologically advanced. They start with kraft paper that scrapbookers would call “acid-free,” but, without getting bogged down in details, there is a lot more to it. Ingredients are added that vaporize over time, releasing the anti-corrosion effect as the calendar ticks by. Close the item and its protective paper in a zipper-locking bag, and the vapors are trapped and “recycled” (although not permanently). Not surprisingly, makers of fine planes and other metal tools also use corrosion resistance to protect their products in transit. There is no need for that protection to end with the shipping process, however. The Lie-Nielsen Card Scrapers pictured below stay in their protective paper whenever not in use. Lie-Nielsen tools use the finest of components, and come to the end user fully protected. There is no reason they can’t stay protected. Organizing Dust Extractor Hoses – Tips from Sticks in the Mud – December 2018 – Tip #1 December Poll: Does Paint Belong on Fine Furniture?